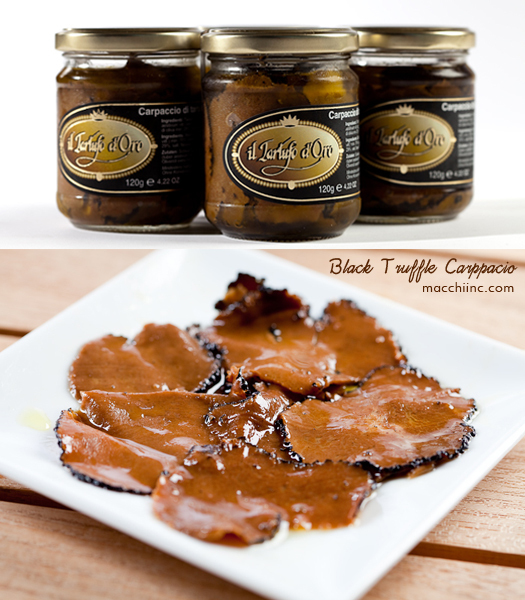 All you need to know about Black Truffle Carpaccio | Montreal Food Importer & Distributor | Exclusive Importer of Citterio in Canada | Macchi Inc. I am, and have been on vacation, in the Quebec Eastern Townships ( Canton L’Est ) since wednesday. Spending quality time with close friends and family, over many good meals from BlueApron.com, makes you realize that to accomplish a successfull dinner; everything matters! We put together some recipes that we had made before and to our surprise they tasted different and we also enjoyed them in a much different way, and the fact that there was a very appreciative audience to feed our egos made the experience even better =). Which brings us to this week's product: Truffle Carppacio; my little sheets of silk. It is made from summer truffles, covered with sunflower oil in a jar. A traditional Umbrian recipe; pasteurized in it’s natural juices, no preservatives or artificial colorings, chilled and then sliced paper thin. It makes it so convenient to spoil yourself or your guests any time. As I gently pluck them out, one by one from the jar, so that they wont rip or tear, the scent and aromas simply hypnotizes me but in difference from the fresh product, it is very subtle. The texture due to being soaked in oil, is very silky and gentle on the palate and no matter what dish or product you end up topping with the truffled carpaccio, you do end up spoiling it very generously. In case you didn’t know, carpaccio in Italian means when something is served raw and is thinly sliced or pounded. Stay tuned for some Tips & Tricks and pictures of how we spoiled our guests with truffle carpaccio.